The residents of Port Coquitlam, British Columbia, have spent the last few days hosting a very old, very fat, and very chill bear. 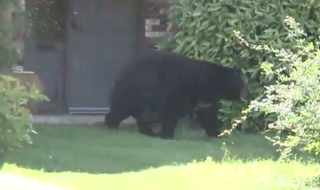 According to local conservation officers, the bear weighs about 500 lbs. and isn't a threat to anybody. "He's just fat, and he's lazy, and he was resting," one told Global News in Canada. At one point, officers attempted to goad the bear into climbing a tree so they could tranquillize it. "He's so obese, he can't even climb a tree," said [conservation officer Jack] Trudgian. "We don't want to tranquillize the bear on the ground, we'd prefer to get him in the tree, but he's so fat." Eventually, the bear found a thick clump of blackberry bushes to fall asleep in.